Kensington proudly offers louvered roof systems for commercial businesses and other establishments that require an effective and cost-efficient shading solution. These smart additions will provide comfort and convenience for your customers or guests, if you are managing a hotel and resort. Find out how else you can benefit from our stylish roofing systems. Kensington’s louvred roof system comes in a range of options. This fantastic system offers protection from the sun or rain at a touch of a button. It also comes in a motorised or automatic configuration for your added convenience. This roofing system allows you to achieve the most favourable environment for your customers. Louvered roof canopies also offer a great return on investment for restaurant owners who are seeking to increase their seating space. The roof louvres will tilt according to shading preference or will completely close, allowing full rain protection during showers. All rain can be discharged via the system’s built-in guttering. Louvered roofs lend a smart and stylish look to any space and improve the efficiency and the aesthetic appeal of your property. If you are looking for a feature that combines form and function, then you will find it in louvered roofs. Our louvred roofs are ideal for a range of applications, including poolside pods, decking areas, restaurants and outdoor eating areas. Customers love shaded areas when they want to relax and enjoy great food. Adding our louvered roof system to your existing structure will be a great benefit to your customers and your business. Just choose a design and our experienced installation team will take care of the rest. It’s that simple. Allow us to design and install the versatile and functional roof systems in your commercial property. Have a look at some of our recent installations by clicking the images on the side. 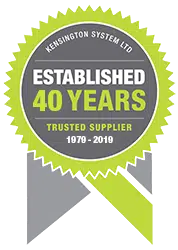 If you are ready to transform your property by installing a roof system, do not hesitate to give Kensington a call. Flexible: the roof’s louvers can be tilted to different angles to address varying shading preference and can be completely closed for absolute rain protection. Convenient: louvers can be opened or closed with a motorised or automatic configuration. Comprehensive: our louvered roofs come with a built-in guttering system for proper discharge of rain showers.